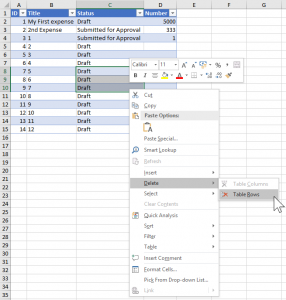 Lists can be exported to Excel. This is great to analyze data. Moreover, this export can be refreshed in Excel so that you can maintain pivots or charts that can be updated over time. However, the link is one way only: there is no way to modify your SharePoint data from Excel. 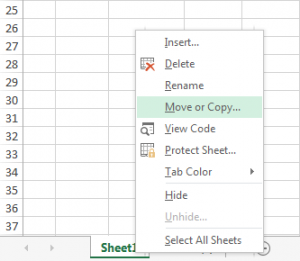 New lists can be created from existing Excel files. Here the Excel file and the SharePoint list keep no connection after the list is created. Microsoft used to offer a way to synchronize Excel files with SharePoint lists, but removed this feature in Excel 2007 and future versions. SharePoint List Synchronizer for Excel brings back this feature, allowing Excel users to open SharePoint Lists in two-way sync. This is also a great way to access SharePoint lists offline. Sync it when you’re online, change what you want in Excel while offline, and sync it back next time you’re online. With SharePoint List Synchronizer installed and active, browse a SharePoint List. If your list is displayed with the “new experience”, you need to switch back to the old one to display the ribbon. Click on “Export to Excel” in the List tab of the ribbon. Click “Open” to open the owssvr.iqy file directly in Excel. You might get a message that you need a compatible application to export a list. Click on OK. You will be displayed a text file in the browser. Right click, Save As, and save the file without changing its name (owssvr.iqy). Then browse your computer to find this file, double click it, it will open in Excel. Depending on your credentials and authentication mechanism, you might be prompted by Excel to enter your SharePoint credentials. 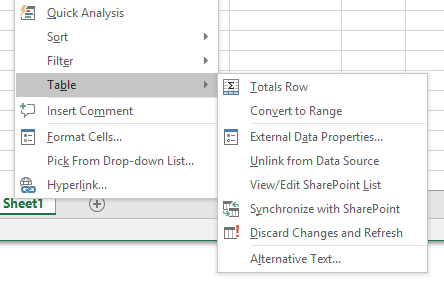 In Excel, right click on a cell in your list, select the Table menu and click Synchronize with SharePoint to synchronize your Excel file with SharePoint. 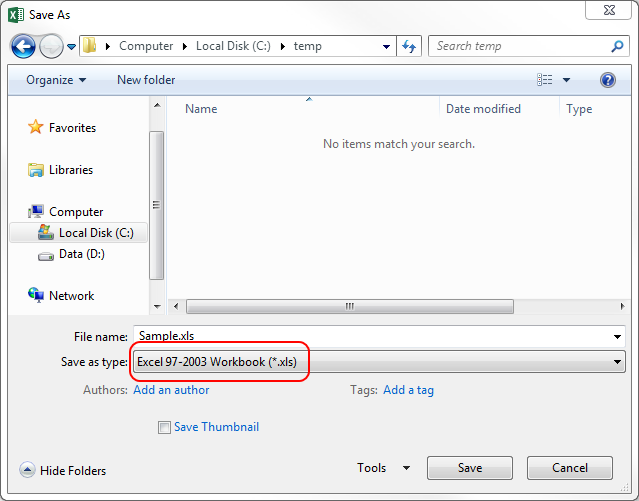 Note: To retain this functionality, should you want to save your file as an Excel file, you need to save the workbook as Excel 2003 .XLS file format, not .XLSX. 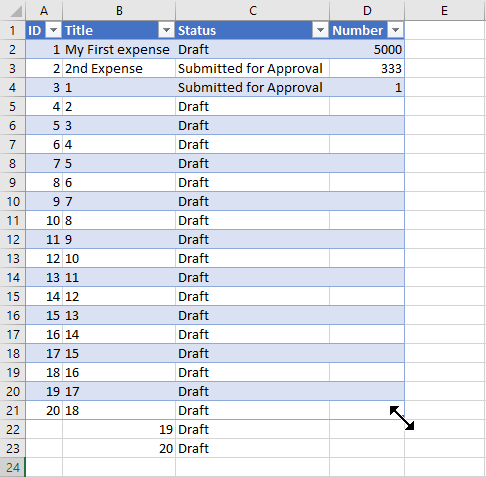 You can either insert rows in your Excel list or add rows at the bottom of your existing list. 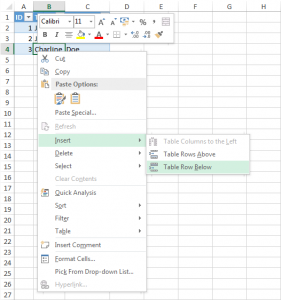 You need to manipulate the Excel “table”, not the whole Excel worksheet. This means that you can’t right click on the row number (outside of the grid) to insert a row. You need to right-click in the table, then Insert / Table Rows Above. Add as many rows as needed and synchronize your file back to SharePoint. 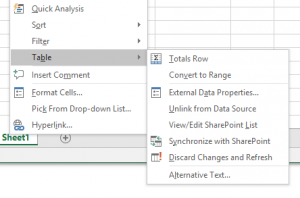 If you look closely, you will notice that in Excel your table is enclosed in a thin blue rectangle showing the boundaries of the table that is synchronized with SharePoint. 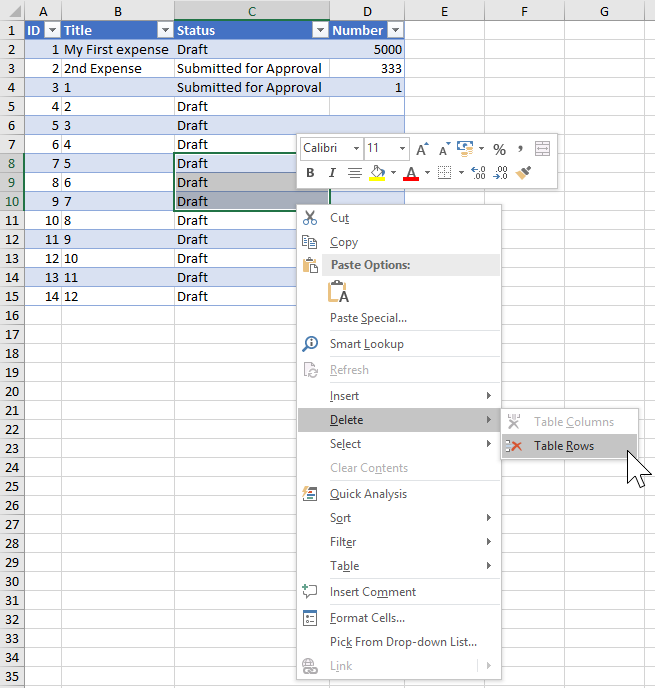 When you add rows immediately after the last row of your table, Excel will most often pick it up and extend the zone. If it’s not the case, then you can extend it yourself by dragging the bottom right corner. First, ensure that no filter is applied to your list. Select a cell in the row you want to delete, right click and select Table / Delete. Similarly, drag a selection over several rows to delete multiple rows at once. Do not select the entire Excel row. Your selection should fit within the table itself. Download the installation file: visit our home page and fill the form to download the setup file. If you have already requested a trial or purchased a full license, you have also received a download link by email. Launch the installer XlSyncSetup.msi. If you have already installed a trial before and need to install your purchased license, you need to uninstall and reinstall. If you have a purchased license, enter your license key during the setup. For trial, skip the license. Note: Don’t forget to replace the “<provided key>” tag by your actual key. Note: The key is per user, not per device. It is automatically installed for the user running the installation. If you need to register your license key for another user, you need to plan for it, running the following command under that user session. For example, using a GPO. If you have a doubt whether SharePoint List Synchronizer is correctly installed, launch “SharePoint List Synchronizer for Excel – Configuration” from your start Menu. If you can’t find it… our product is not installed. Try again. 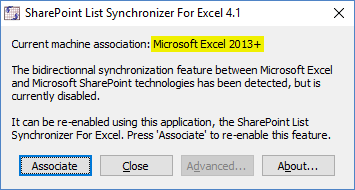 If you see that current association is SharePoint List Synchronizer For Excel, you’re all set. If you see that association is “Microsoft Excel…”, then our product is installed but inactive. Click on Associate to finalize the process. 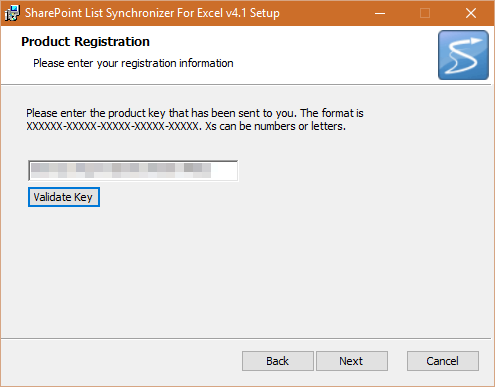 The SharePoint List Synchronizer for Excel supports such scenario thanks to its “Basic authentication over non-SSL connections” feature. In a nutshell, activate this feature if you are using Excel 2010 and your SharePoint Lists are hosted on a site with basic authentication activated over non-SSL HTTP connections. Then check “Enable Microsoft Office Excel 2010 Basic authentication over non-SSL HTTP connections”. Note: To disable the feature, repeat the same steps and uncheck it. By activating this feature, Excel will now prompt users for their credentials and pass them to the site. 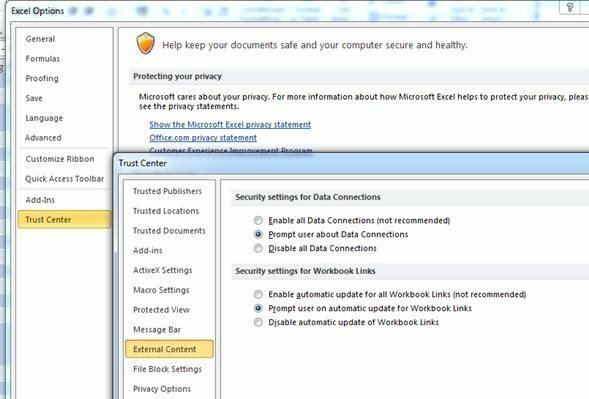 This way, Excel 2010 users will be able to open SharePoint Lists from access protected sites in two-way sync over again. Using Excel 2013 and higher. With Excel 2013, 2016, 2019 or higher, for security reasons, you must use SSL if you use basic authentication. Important note: Even if you uninstall Excel 2013/2016/2019 and revert to previous versions, you won’t be able to use basic authentication without SSL. All versions of SharePoint since SharePoint 2003 are supported. Is SharePoint List Synchronizer compatible with Office 365? 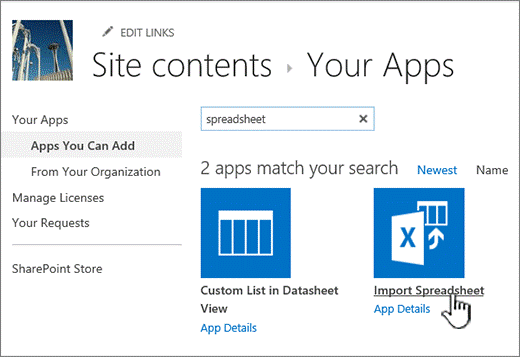 Yes, you can synchronize a list between Microsoft SharePoint Online (Office 365) and Microsoft Excel. Can I save a workbook that contains a synchronized list? How to insert a row from a synchronized list in Excel? Right click on one cell of the table, then Insert / Table Row Below or Table Rows Above. How to delete a row from a synchronized list in Excel? Right click on one cell of the row you want to delete, then Delete / Table Rows. It does not work if your table is currently filtered in Excel. 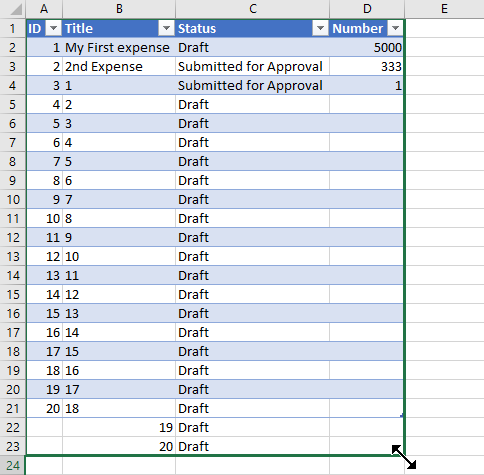 Can I have multiple synchronized lists in one Excel workbook? 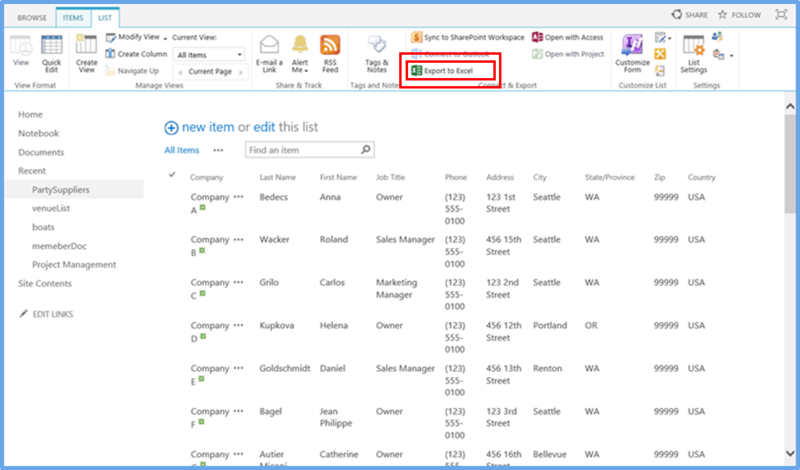 Export SharePoint lists to Excel => you now have one workbook by list. Can I synchronize any type of column? Add formulas in SharePoint. Excel will display their result as read-only. You can add a text column in your SharePoint list and use it to store a formula in Excel (you might need to change the cell format in Excel). But when syncing back to SharePoint, SharePoint will replace the formulas by their result. So you will need to reenter your formula after every sync. Multiple selection: Excel doesn’t support drop downs with multiple selections. Enhanced rich text: read only. It will be displayed in Excel, but will not offer the option to change it (Excel will display an error message before any error is done). Yes, if they expose the same information as manually created columns. You might need to add an attribute List=”UserInfo” in the XML file you use to create your column. What happens when two people edit the same row in Excel and then synchronize? Basically, if ever there’s a conflict, a conflict window pops-up and the user is in charge of resolving it. Regarding synchronization, after the first sync, it only syncs the items you’ve changed. Therefore, when working with synchronized lists, what you should do is start by doing a “Discard and Refresh” on your list to ensure your data is up-to-date and then start working from there. Of course. However only active resellers promoting our products qualify for reseller discounts. Both end customers and resellers but online on our web site. If you purchase for another company, please enter the name and contact details of your end customer in the Comment field during the checkout, to ensure that your customer has access to updates and support. Is the license for SharePoint List Synchronizer a perpetual license? Yes! SharePoint List Synchronizer is a perpetual license. Does the price include maintenance/upgrades? Not only the license is perpetual, but when a new version is released, your license key will still be valid, allowing you to download and activate it. What are the purchase and delivery methods? The purchase method is online only on our web site. You will get the download link and license key on our web site and by email immediately after your purchase. Is the product available per user or per machine? 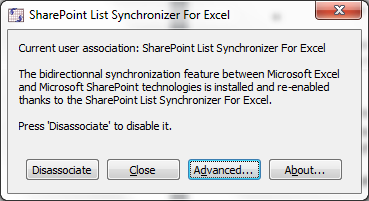 I am using Microsoft Excel and have installed the tool but not able to get “Synchronize with SharePoint” option? The menu is available when you right click a synchronized table (as explain in the documentation). The installation of our tool is on a per user basis. If it was installed using another windows account, the association is not done. When you save the file, it must be in the XLS format (Excel 97-2003). 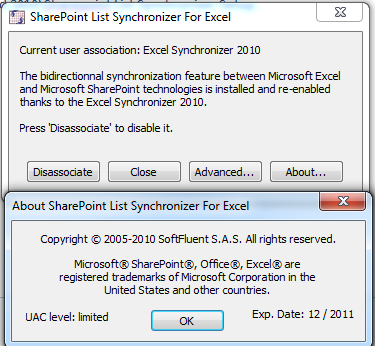 If you use the XLSX format (Excel 2007+), the synchronize menu won’t be available. Excel should open and the synchronized list should be there. 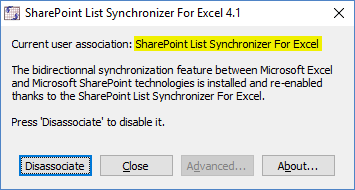 The SharePoint List Synchronizer only opens Excel in the right setting for the synchronization feature to be accessible, and does nothing else regarding the synchronization between data. The synchronization process is still handled by Excel and SharePoint, and it is done using the ID column, which may not appear on the list (on either Excel or SharePoint). Duplicated rows usually mean that the IDs do not match; thus, the rows are added instead of being updated. A suggestion would be to display this ID column and make sure everything works normally. An Excel sheet linked to a SharePoint list changes (more precisely, increments) all the IDs in the first ID column. Since SharePoint updates existing rows based on the ID passed by the Excel sheet, it becomes confused when the IDs do not correspond to the original item ID and might cause the errors described in the Issue Description section. If you try to copy rows that don’t have consecutive row numbers in Excel. It appears that Microsoft Excel does not support the ability copy such rows into new rows in the same linked table. Experiencing some difficulties? Support is available via email or through the chat feature of this site. Copyright © 2018 SoftFluent Software, 5 rue de la Renaissance, 92160 Antony, France.